Product code:F100128300. MPN F100128300. HEADLIGHT/HEADLAMP [CEV]. Informazioni tecniche: CEV 497. Aprilia SR Carb. COMPARATIVE (ORIGINAL):REV AP8212771. This is a genuine Sinnis OEM part and is a direct replacement for your original part. This part is an OEM replacement for the following Sinnis Scooters: Sinnis Shuttle 125 ZN125T-7 Sinnis Shuttle 125 EFI ZN125T-7E This part is also suitable for other Scooters with variations including: Lexmoto FMS 125 ZN125T-7H Direct Bikes Cruiser 125 DB125T-7 Please double check the picture to make sure it matches your original part before ordering, if you're unsure if this will fit your bike drop us a message with your make, model and year and we will get back to you within 24 hours.. FITS FOR ALL VESPA LX models. WITH BULBS! OEM PART NUMBER 58259R. Double your traffic. Product code:F100130600. MPN F100130600. HEADLIGHT/HEADLAMP [CEV]. Informazioni tecniche: CEV 534. Main & dipped beam socket: BA20d, parking light socket: festoon, w/o bulbs, incl. headlight plug and headlamp rim. Genuine Piaggio Headlight MP3 125-250-300-400-500 Bis 2007-2015. Condition is used See pictures The glass on one side is a bit steamy Doesn’t affect the light Thanks fir looking. Dispatched with Hermes Tracked. 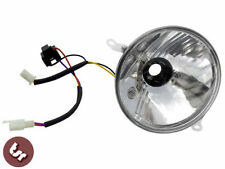 Yamaha YP125R and YP250R XMAX Front headlight Assembly. Yamaha RRP new £176.00. In good condition and full working order. Sinnis Harrier 125 ZN125T-22. Sinnis Harrier 125 EFI ZN125T-22E. Headlight Assembly. If there are any problems or delays with your order we will notify you within 24 hours of the order being placed. Direct Bikes Spyder 125 DB125T-22. EAN Non applicabile. Collocazione Frontale. Gilera Typhoon 50 from 1994 to 1999. GILERA STORM 50 from 1994 to 1995. MPN Non applicabile. Code: < span class = "notranslate" > < span class = "notranslate" > < span class = "notranslate" > 292312. Headlight for GS-811 (3 wires). Light Bulb 12V 35W/35W PART 13M046. TP Peace Sports. GS-811 Peace 49cc Scooter. Other (1) © 2003-2017 Fancy Scooters LLC. electric scooters farings (6). Reverse Cable (2). PIAGGIO FLY 50 58178R 2005-2011 ORIGINAL HEADLIGHT HEADLIGHT C44100 C44700 . GS-824 Peace 49cc Scooter. Headlight for TPGS-824 (4 wires). Light Bulb 12V 25W/25W PART 13M045. TP Peace Sports. Triple Tree Bearings (5). gas scooter switch buttons (11). gas scooter farings (43). ATV Remote Kill Box (1). PEUGEOT SUM-UP 125 2008. WITH WIRING HARNESS. AND HEAD LIGHT BULB RUBBER COVERS. HEAD LIGHT ASSEMBLY. Cash On Collection: No Problem! USED GOOD SOLID CONDITION. APRILIA SR 50 R 2009. FOR SALE IS A USED PART REMOVED FROM A 2009 APRILIA SR 50 R. HEAD LIGHT ASSEMBLE. PEUGEOT PT No PE760408. GENUINE PEUGEOT RIGHT HAND HEADLIGHT ASSEMBLY TO FIT THE JETFORCE 50 FUEL INJECTION MODEL. 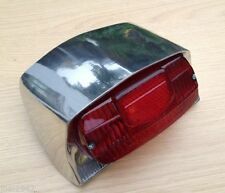 WE HAVE MANY OTHER PEUGEOT PARTS FOR CLEARANCE ON OUR SITE. WE ONLY HAVE 1 OF THESE AVAILABLE AT A BLOW OUT PRICE OF ONLY £59.00. SKU#:PART13M032. Head Light for GS-805 (4 wires). 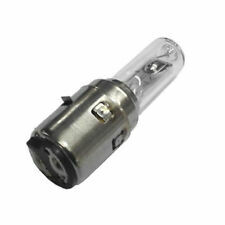 PART13M041 Headlight Bulb (12V 25/25W). TP Peace Sports. GS-805 Peace 49cc Scooter. 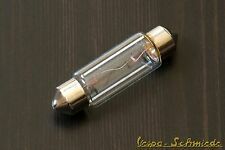 PART13M043 Light Bulb 12V 35/35W. Triple Tree Bearings (5). ATV Remote Kill Box (1). HEADLIGHT/HEADLAMP [Triom]. Product code:T7169010. MPN T7169010. Vespa: ET4 125 & 150 cm³. Piaggio: Liberty with 125 & 150 cm³. Base: Low beam PK22s (H3) / high beam PX26d (H7) / light W 2.1 x 9.5 d.
Suitable for. LifanSwift 100 LF100-A. 58178R HEADLIGHT HEADLAMP PIAGGIO FLY 50 4T 2005-2011 ORIGINAL C44500 C44200 . HEADLIGHT/HEADLAMP [Triom]. Product code:T17339010. MPN T17339010. You'll also find us on line. We call it '3D Bay'. PART AS PER TITLE AND PHOTOS. Complete Carello Headlamp assembly for Li 125 , Li 150 series 3 and LI 4 . No bulbs In lamp this item is New Old Stock over 50 years old but in effect brand new and in perfect showroom condition. Seller away till 10th October , sorry can not post till then , thanks! The bulb holder is designed for a 2-phase bulb 6V or 12 V 15/15 watts and fits specifically for Puch Maxi, X 50, Pioneer but also X 30, Hercules, Zündapp, Kreidler, NSU, Solo, Garelli and many other moped / moped models. PK / XL / XL2. Ø 135mm / side screwed. Headlights incl. 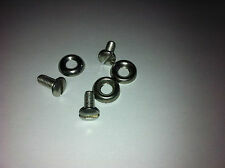 2 versions, 2 light bulbs (PX43T & Ba9s), 3 screws, 2 nuts and 1 washer! 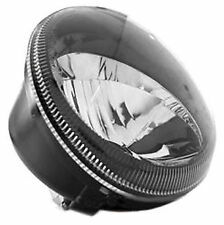 ORIGINAL 584977 HEADLIGHT HEADLAMP PIAGGIO VESPA GTS IE & 2011-2012 M45200 300 TOURING . (PART No: AP8224224. Habana-Mojito Custom 50 2T (Eng. Aprilia) 1999-2004. Piaggio) 2004-2008. NEW GENUINE APRILIA. LIGHT ASSEMBLY. NORTHEN ISLAND OR ANY OTHER. NORTHEN ISLAND AND. 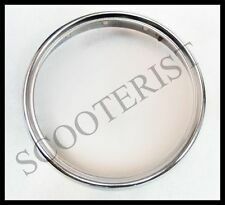 FITS FOR ALL VESPA GTS GTS 125 200 250 300 cc models. Bulbs included! GILERA Runner 50 ZAPC14 (2Pin connector). By Piaggio, Vespa, Gilera and APE. Fits only the C14 runner with 2 pin connector! New and used parts. Large range of products at super prices. Specializing in models. VespaP X 125-150 200VNX1 VLX1 VSX1. Teilebereich Beleuchtung & Blinker Scheinwerfer. Baugruppe Beleuchtung & Blinker. By Piaggio, Vespa, Gilera and APE. Kraftradmarke Vespa. New and used parts. State NEW, NOS bearing products. Derbi engine parts. Derbi Panel. Derbi add-on parts. 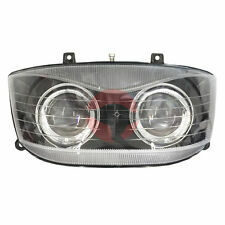 Headlights headlight above Derbi GPR original 00 H 01018011. Headlights Derbi GPR above. DERBI GPR 2T, LC, 2003, replica racing 50 VTHGPRRWB. DERBI GPR 2T, LC, 2002, replica racing 50 VTHGPRRWB. SYM GTS 125 (2005-2007). -SYM headlights. distinct impression of the product to receive, because honesty is the key. because of this is before creating the range of each part by my hand. set to open is not equal to a case. Original 582476. Piaggio Ciao Bravo parts. Piaggio engine parts. 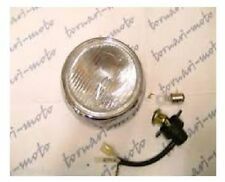 Headlight incl cable / bulbs Piaggio Beverly 125/ 200. Piaggio Beverly 4 T, LC 125 ZAPM 28100 00001001. Piaggio Beverly 4 T, LC 200 ZAPM 28200 00001001. 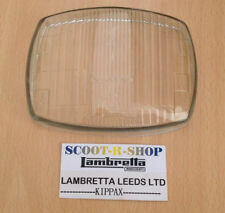 HEADLIGHT CEV 568 Aprilia???. / CEV 3046672. 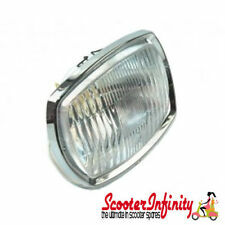 CEV headlight 568 Aprilia???. Aprilia add-on parts. Aprilia engine parts. Aprilia fairing parts. If you dissatisfied with the item be not equal neutral or negative there is a solution for everything. 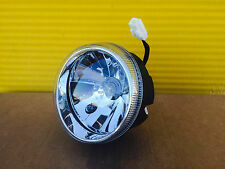 New original SYM front light / headlight. SYM RS 125 HS12W-6. Shark 50 E1 BS05W-6. Shark 125 HS12W-6. 33100-H3A-000 head light / headlight. suitable only for complete with bulbs, sockets and wiring. Fits the Yamaha Aerox and MBK Nitro even with the 100 cc version. The first double-optics for Yamaha Aerox MBK Nitro or with E-mark. Double optic halogen headlights with E-mark. Piaggio TPH 2 T, AC 50 TEC 1 T 0 0001001. Piaggio TPH 2 T, AC 80 TE81T 0001001. Piaggio TPH X 2 T, AC 50 TEC 2 T 0 0001001. 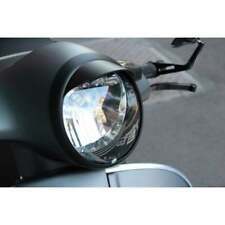 Headlight for Piaggio Typhoon Gilera Storm. Head Lamp with E13 Approval. 2017 Peugeot Satelis 125 Black Edition righthand rear indicator/tail unit.